Do you own a home away from home? We offer a variety of services to keep your caravan up to showroom standards! Spick ‘N’ Span Services offer a standard wash and wax service or, for an even brighter shine, a wash, wax and polish service. These services keep your caravan looking brand new! 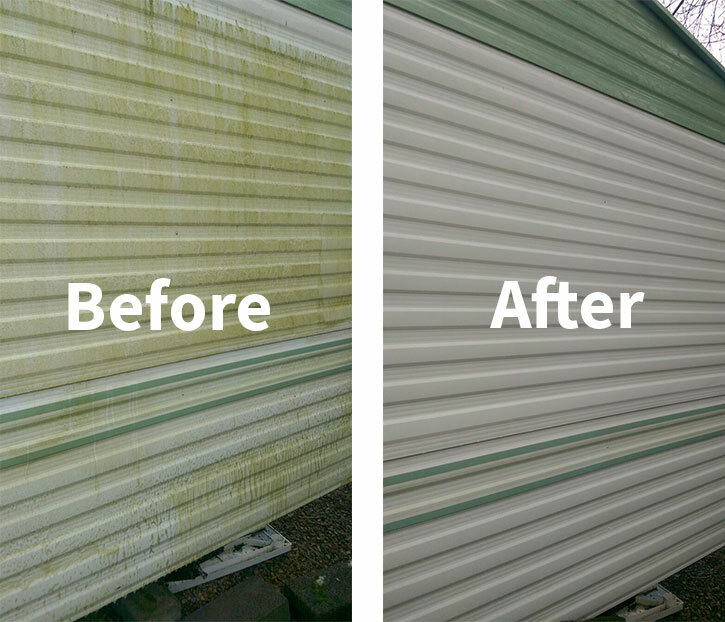 There’s no need to worry either because we hand wash every caravan we clean to ensure no water damage occurs. Our wash and wax service also includes having your gutters cleared and cleaned, at no extra cost. Decking looking a little green? Feels like an ice rink under your feet? Not quite as WOW as it was at first? It may just need a little TLC to get it back up to scratch! Spick ‘N’ Span Services offer a decking and paving pressure washing service and will have your decking and patios looking great, ready for BBQ’s all summer long. After a relaxing break, the last thing you want to do is clean up! So give Spick ‘N’ Span Services a call and we will arrange with you to come and do a change over clean that’s convenient for you so that it’s lovely and clean for when you, or your guests, arrive next time. The views from your caravan can be the best thing about a relaxing holiday in glorious Wales… That is if you can see them through the dirt that the sea air and Wales’s famous weather brings! Along with sticky fingerprints and the normal mucky marks, dirty windows can really take the oomph out of that beautiful sea view. But Spick ‘N’ Span Services can get your windows crystal clear in no time, and with pure water technologies, your windows stay cleaner for longer! Lazy days at the beach, games of football, BBQ’s and rainy days staying in can all take a toll on your caravan’s carpets. Sand from your bags, mud from your trainers, tomato sauce from the hot dogs or a spilt drink in a heated game of monopoly, memories you don’t want to forget, but stains you would rather be rid of! Spick ‘N’ Span Services can have your carpets and upholstery looking fresh and clean in no time at all! We take care of the cleaning, whilst you have all the fun! As the season comes to an end, your home away from home may be looking slightly worse for wear after a good summer of fun, but the idea of cleaning it can be daunting! Spick ‘N’ Span Services can provide a thorough deep clean throughout making sure its left ready for the next season to begin. Spick 'N' Span Services was established in 1994 and has been providing cleaning services across North West Wales ever since.